Last year, New Mexico’s long-standing love affair with turquoise heated up when the Museum of Indian Arts and Culture opened its blockbuster exhibit Turquoise, Water, Sky in April. The show inspired our cover story, “The Spirit in the Stone” (mynm.us/spiritinthestone), and related editorial coverage, “On the Turquoise Trail” (mynm.us/turquoisekooser). If you’re among the thousands who made a pilgrimage to Museum Hill to admire the exhibit’s 500 turquoise objects, or if our articles whetted your appetite for more full-color photos, history, and lore about our beloved state stone, this companion book delivers the goods. MIAC curator Maxine McBrinn and her research associate, Ross Altshuler, give readers an intimate, behind-the-scenes look at the meanings, methods, mines, and makers connected with the show’s objects. The treasures include Southwest Native American turquoise beads, jewelry, boxes, cases, and fetishes, dating from AD 900 to today. 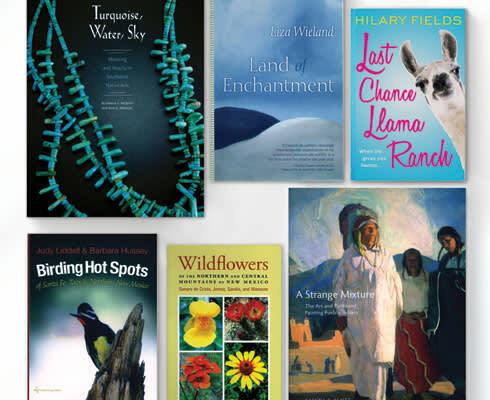 The book offers evocative examples of the ways in which many Native cultures have long attributed the life-giving properties of water and the heavens to the blue and green stone. To express that relationship, their craftspeople combine turquoise with material from aquatic environments—shell, pearl, coral—and have traditionally included in their designs such water-related motifs as frogs, clouds, and rain. Many artists create elegantly fluid mosaics to further evoke the ocean. Images of such skillfully inlaid jewelry are included here: A real standout is the oversize domed cuff, made in 1998 by Angie Reano Owen (Santo Domingo Pueblo), that displays an intricate crosshatch mosaic in turquoise and spiny oyster, with a half-inlaid scallop shell set on top. For Native peoples, turquoise also represents bounty from nature—whether that comes in the form of prosperity, vigor, healthy children, or abundant crops. It’s used for healing, as in the Diné culture; in ceremonies; and as a talisman for granting protection—which can even extend, as members of the Chacoan culture believed, into the afterlife. Striking photographs of jewelry pieces—and of Native men and women wearing them (many of those taken by Santa Fe photographer Kitty Leaken)—fill the glossy pages of Turquoise, Water, Sky. Along with the usual explanations of provenance, the captions afford easy-to- understand descriptions of the methods used to create objects. A few modern pieces have delightful tableaux worked into the silver as a way to hold a Pueblo-specific narrative. Of special note are two dramatically elongated silver-overlaid rings, each with a blue triangle of turquoise, that were made in the mid-20th century by Santo Domingo artist Vidal Aragon. One portrays a Pueblo village; the other shows a Native woman balancing a pot on her head. A 1995 brooch/pendant by Anthony Lovato, another Santo Domingo artist, stylizes a female figure with a water jar on her head; her oval face is the earthy-green turquoise cabochon set in the piece. A surprising semicircular silver purse with a silver-chain strap, created in 2007 by Ohkay Owingeh/Taos Pueblo artist Mike Bird-Romero, shows the four directions, each of them punctuated by a brilliant-blue turquoise gem. Turquoise-, history-, and jewelry-lovers alike will want to add this book to their shelves. Readers inspired to further augment their knowledge can make good use of an included appendix describing 31 well-known Southwestern mines and a glossary that defines relevant jewelry-making terms. Two new regional guides to New Mexico’s flora and fauna offer avenues for clueing in to the details of our great outdoors and learning more about the state. Did you know that wild turkeys roam along NM 38 between Questa and Eagle Nest? Or that, north of Pecos, ospreys frequent Pecos Benedictine Monastery’s lake? The Clark’s Nutcracker, a handsome little black-beaked creature with reverse tuxedo coloring, roosts in the environs of the Enchanted Forest Cross-Country Ski Resort. Judy Liddell and Barbara Hussey have followed their Albuquerque-area Birding Hot Spots guide with this equally detailed book, which is accessible to neophyte birders and satisfying to buffs. The authors’ conscientiously thorough directions serve as walking-tour narration, right down to the location of the park bench, what bird you might see once you sit down, and what its song sounds like. Although photos are peppered throughout, if you don’t have a working knowledge of what the cited birds look like, you’ll want to do some online searching beforehand so you can recognize them in the field. Between the two world wars, iconic New Mexico painters Ernest Blumenschein, John Sloan, Marsden Hartley, Awa Tsireh (San Ildefonso), and Georgia O’Keeffe were inspired to portray the singularly colorful lifeways of the Native Pueblos around them. Art historian Sascha T. Scott examines how works by those artists helped bring about positive social change in Pueblo communities in terms of public policy. During that time period, US federal policy was beginning to shift away from the forced assimilation of Native Americans and toward their eventual autonomy. Yet, throughout the US, the belief that Native communities here were passive, uncivilized, and even “vanishing” remained widespread. The artists’ images of the Pueblos often accompanied anti-assimilation articles in The New York Times and McClure’s, with the artists themselves doing the writing and giving interviews in support of Natives’ rights to self-determination. This contributed to the passing, in 1934, of the Indian Reorganization Act (aka the “Indian New Deal”). Though imperfect and sometimes embattled, its mission was to reverse the effects of assimilation and protect tribes’ traditions and cultures. This gorgeous book’s many lush reproductions (totaling almost five dozen) serve as arresting corroboration for Scott’s thematic forays. Throughout A Strange Mixture, Scott nimbly weaves together interdisciplinary research from the fields of history, art history, anthropology, and indigenous studies to bolster her wide-ranging scholarship. A must-read for Taos and Santa Fe art colony enthusiasts, as well as for anyone interested in this country’s many layers of social history.—S.H. A novel that braids eras, areas, and generations, Land of Enchantment follows the lives of Brigid Long Night, a (fictional) Navajo artist mentored by Georgia O’Keeffe as a young girl, and Long Night’s estranged daughter, Sasha Hernandez, who begins her freshman year at Columbia University a few days before 9/11. The potential for resolution of the mother/daughter rift provides a gravitational pull that leads the collage-like narrative forward. Brigid develops into a renowned painter whose work becomes characterized for its sublime inclusion of the not-pretty, part of a generation of innovative Native artists who eschewed making work that appealed to conventional tastes. Although not directly influenced by her mother, Sasha embarks on her own creative mission to capture the raw sadness of 9/11 on the streets of New York with her video camera. Wieland’s steady prose also captures life’s telling, unsettling details, with a beauty that makes it all not just bearable but also transcendent. —C.W. This smart, bawdy, tenderhearted beach read portrays the second act of its heroine’s life. Merry Manning was poised to scoop up Olympic gold medals when an unfortunate and career-ending accident derailed her. She gamely/grudgingly pivots to a new career as the blogger behind the series “Don’t Do What I Did” and is assigned to work at a funky llama ranch in northern New Mexico. Enter myriad mishaps, along with a cast of characters both furry and bearded (love-interest alert! ), cosseting and cantankerous, who help this feisty yet fragile gal put the pieces back together. The book’s peanut gallery: Merry’s blog commenters, who enthusiastically take her quirky posts viral, giving a boost to the local economy.—C.W.